The 20-month Pace University Executive MBA (EMBA) program at Lubin School of Business is ideal for experienced managers and professionals. It offers the opportunity to pursue an experiential and project-based MBA in less than two years. It’s a cohort-based program that was designed to be highly flexible to suit the working professional. Students complete online instruction alongside weekend residencies in New York City every ten weeks. In total, EMBAs will only spend 34 days on campus. The program is broken into nine modules which include individual assignments and team-based projects. Students will have to solve real-world business problems and present their findings to industry experts. The 20-month Pace University Executive MBA includes eight modules requiring individual and team exercises, and a final capstone module, which combines an individual project and business simulation. Students work on these projects using the Internet platform, Blackboard. Team projects require students to solve contemporary, large-scale business problems utilizing a holistic, cross-disciplinary approach. Students also apply what they learn to specific consulting projects for working companies. The capstone module combines a business simulation experience with an individual student-proposed project, which may be an actual business problem the student is facing or a new business idea the student wishes to explore. Module topics include Business Analysis, Marketing, Corporate Diversification Strategy, Competitive Business Strategy, Corporate Finance, Operations Management, Public Policy, and Organizational Behavior and Change. The 20-month Pace Executive MBA program costs a total of $78,000. This cost includes textbook materials and software, hotel accommodations and meals during residencies, networking events, conference phone fees, and graduation fees. All accepted students must pay a $1,000 non-refundable deposit that is then applied toward tuition. The program then offers students the option of spreading the tuition cost over two years, with payments due two weeks prior to the beginning of each module. The program encourages students to speak with their employers about sponsorship and tuition reimbursement plans. 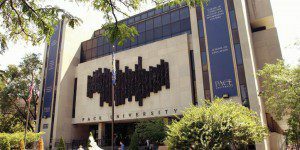 Applicants may also contact the Assistant Director of Financial Aid at Pace University’s Financial Aid Office for information about Federal Stafford loans. Applicants to the Pace/Lubin Executive MBA program should have a minimum of five years of business experience at a manager level or above, be comfortable in an online learning environment, be self-disciplined, self-motivated, and able to work well in teams. Applicants must submit a completed application form, a current résumé, complete official transcripts of all collegiate and graduate work, and two written recommendations, including one from an immediate supervisor and one from a general manager. A personal interview with an EMBA faculty member is also required, while GMAT scores are not. Lastly, applicants must also submit a $95 application fee.